The way Lehman was structured was pretty risky. A little over 2% fall in the value of its investments would have wiped out its equity completely. Mumbai: On 11 April 2008, Henry Paulson, the then US secretary of the treasury met Richard Fuld, the chief executive officer of Lehman Brothers at a dinner. “I am worried about a lot of things," Paulson told Fuld. Andrew Ross Sorkin recounts this conversation in his book Too Big To Fail. Paulson also told Fuld that he was “anxious about the staggering amount of leverage—the amount of debt to equity—that investment banks were still using to juice their returns". The leverage had Paulson worried. Lehman Brothers was leveraged at 30.7 to 1 at that point of time. Merrill Lynch was at 26.9 to 1. While leverage spruces up returns when times are good, it also causes problems when times are bad. In fact, hedge fund manager David Einhorn believed that if calculated properly, Lehman Brothers had a leverage of 44:1. At a conference, Einhorn explained that even a 1% fall in the value of the investments of Lehman, would wipe out half of its equity and push the leverage to almost 80 times. What did he mean by it? Let’ say a firm has $1 of its own money (i.e. its equity). It borrows $44 and invests $45 in total. The investment falls in value by 1%. This means a loss of $0.45. This has to be adjusted against the firm’s equity of $1. Now the firm has only $0.55 of its own money left. On top of this, it has a borrowing of $44. This means the firm’s leverage is now 80 ($44/$0.55). Hence, the way Lehman was structured was pretty risky. A little over 2% fall in the value of its investments would have wiped out its equity completely. This leverage came back to haunt Lehman a few months later. It had to file for bankruptcy in the Southern District Court of New York at 1.45am on Monday, 15 September 2008. A decade has gone by since. How is the world placed ten years after Lehman Brothers? Banks and financial institutions did not always operate on high leverage. In fact, as Anat Admati and Martin Hellwig recount in their book The Bankers’ New Clothes: “Early in the twentieth century, it was still typical for banks to have equity equal to 25% of their total assets, but banks’ equity levels declined to single digits, around 6-8% of their total assets in the US, by early 1990s. Similar trends were observed in other countries. Indebtedness further increased for many banks in the run up to the financial crisis of 2007-2008." Over the years, banks and financial institutions got into all sorts of trading activities. Buying and selling stocks, bonds, derivatives, real estate, and so on. When these markets were doing well, as they were between 2002 and 2007, borrowing money to invest and spruce up returns, made immense sense. But post 2007, when the markets seized up, in particular the real estate market in the US and Europe, all the excessive borrowing which had created leverage and the illusion of high returns, came back to haunt these banks. Many of them had to be rescued by central banks all around the world. One reason for the excessive leverage was the low interest rates that prevailed in the Western world, especially in the US. A major reason for low interest rates was all the foreign money coming into the US to be invested in treasury securities issued by the US government. Treasury securities are financial securities issued by the US government to finance its budget deficit, or the difference between what it earns and what it spends. In January 1995, the total amount of foreign investment in US treasury securities was around $671 billion (see Chart 1). Ten years later in January 2005, this had shot up to around $1.91 trillion. By January 2008, the investment had further increased to $2.56 trillion. At that point of time Japan led the pack with a total investment of $585.6 billion in American treasury securities. China came in next with a total investment of $492.6 billion. All this money chasing American treasury securities ensured that the yield to maturity (or per year return an investor would get on these securities if he held them till their maturity) went down over the years (see Chart 2). Treasury yields were largely falling from the mid 1990s, up until 2008. The yield on these securities set the tone for the overall interest rate scenario in the US, as lending to the government is deemed to be the safest form of lending. And this basically ensured that the overall interest rate scenario in the US was low. It allowed banks and financial firms to borrow more and more money in order to speculate in the financial markets. It also allowed individuals to borrow more, and that first led to the dot-com bubble and which was followed by a real estate bubble. The question is where did all these dollars come from? Post the World War II, global trading moved towards the US dollar. This led to central banks around the world ending up with huge dollar reserves. These dollar reserves then found their way to be invested into American treasury securities and other American debt securities. All this money coming into the US helped keep interest rates low. At lower interest rates, not just US banks and financial firms could borrow more and spruce up their returns, so could the average American, which is precisely what he did. Low interest rates allowed Americans to borrow and buy homes. It also allowed them to take on consumer loans and encash the equity in their homes and spend it on consuming other goods. So, the Americans could buy cars from Japan, apparel and electronics from China and so on. 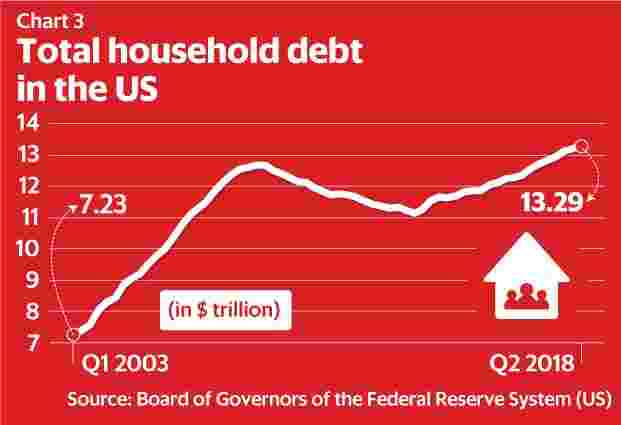 As can be seen from Chart 3, the total household debt in the US, went up dramatically from $7.2 trillion in early 2003 to a peak of $12.7 trillion in 2008. And so the cycle worked. The US shopped, China earned, China invested back in the US, the US borrowed, the US spent, China earned again and China lent money again, by investing in treasury securities. The same was true with Japan, though to a lesser extent. The US makes up for one-fourth of the global gross domestic product (GDP), and the structure explained above, is a major reason for it. The US dollar continues to be at the heart of both the global financial and the trading system, as they have evolved. In this scenario, countries all around the world have continued to accumulate dollars. And these dollars have found their way back to be invested in the US. The foreign investment in American treasury securities at the beginning of 2008 was at $2.56 trillion. Since then it has gone up to $6.32 trillion. The Chinese investment in treasury securities stood at $1.17 trillion in January 2018. The Japanese investment was at $1.07 trillion. This has ensured that treasury yields in the US have largely been less than 3%, which has also led to lower interest rates in general. The foreign investment in other debt securities has jumped up from $1.86 trillion in early 2008 to $3.4 trillion in early 2018. These investments, along with the quantitative easing carried by the Federal Reserve in the aftermath of the 2008 global financial crisis, have ensured that interest rates in the US continue to remain low. While the household debt fell in the aftermath of the financial crisis, it has started to rise again, though as a percentage of the US GDP, it is still lower than the 2008 level. The banks and the financial firms have also not gone on a borrowing frenzy as they had before 2008. In 2008, their borrowing peaked at $15.5 trillion. It has since fallen and in 2017 stood at $13.9 trillion. Even with the fall, their borrowing continues to remain huge. The US government borrowing has jumped from $8.95 trillion in 2007 to $20.21 trillion in 2017. The government has made the best of the low interest rate scenario. While the financial firms haven’t increased their borrowing, the non-financial US corporates have (see Chart 4). 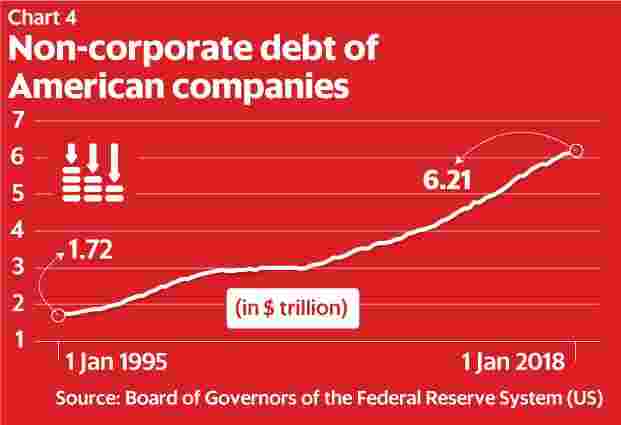 The total debt of the corporates has gone up from $3.4 trillion dollars at the beginning of 2008 to around $6.2 trillion at the beginning of 2018. The hope was that at low interest rates, corporates would borrow and expand their businesses, and in the process create jobs. What they have done instead is borrowed money in order to buy back their shares and in the process pushed up their earnings per share. The stock market has rewarded them by driving up their stock prices and helped the senior management who own ESOPs. This phenomenon of the stock market reaching newer highs in the post Lehman world is evident in Chart 5. 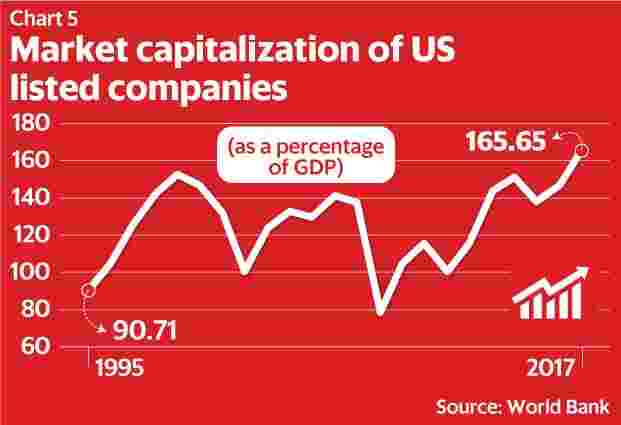 The market capitalization to GDP ratio of the US, was at 165.7% in 2017, the highest level ever. This was thanks to low interest rates in the US, which continue to prevail. This rally in US stocks has translated into stock market rallies all over the world. Data from the World Bank tells us that the market capitalization to GDP ratio at the global level in 2017 stood at 112.6%, the highest since 2007 when it was at 114.3% and 1999 when it was at 116.7%. Easy money available at low interest rates has found its way into stock markets and other financial markets all over the world, including India. The problem is that these rallies are not backed by enough company earnings. As and when this unravels, it will end up creating a new set of problems, like the financial crisis of 2008 did. The global financial and trading systems, as they have evolved, are at the heart of this crisis, and there is really no way to solve this. These systems will keep creating problems in the form of asset bubbles of different kinds. This dynamic also played a part in creating the Japanese stock market bubble of the late 1980s, the South Asian bubble of the mid 1990s and the dot-com bubble of the late 1990s and early 2000s. Until a global challenger to the US dollar comes along, this system will keep throwing up other bubbles. And that should worry us.